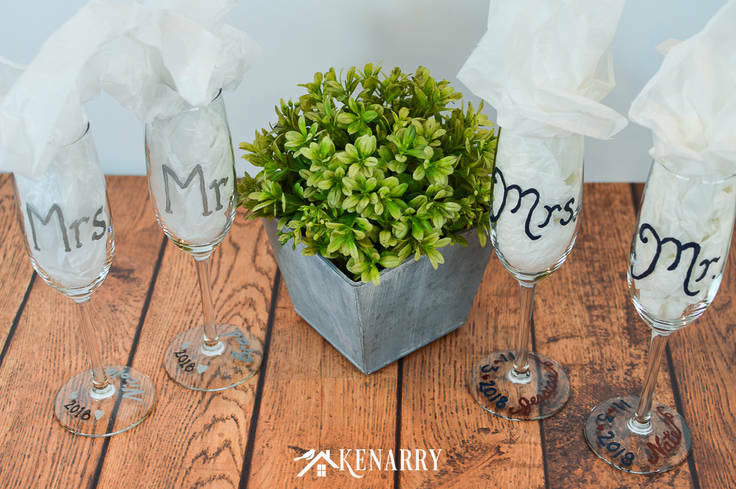 Learn how to make personalized hand painted champagne flutes. 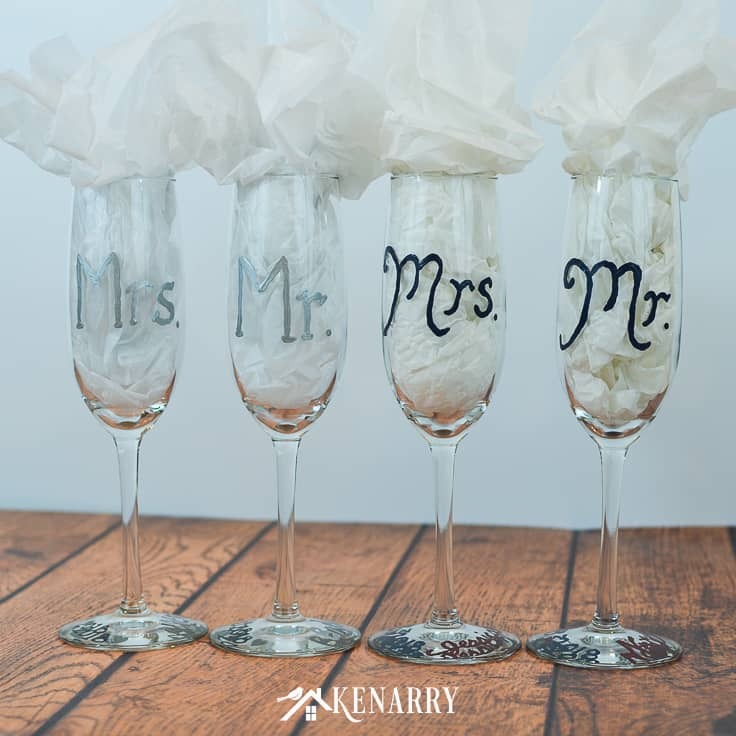 These Mr. and Mrs. toasting glasses are an easy DIY gift for the bride and groom, perfect for a bridal shower, wedding or anniversary. 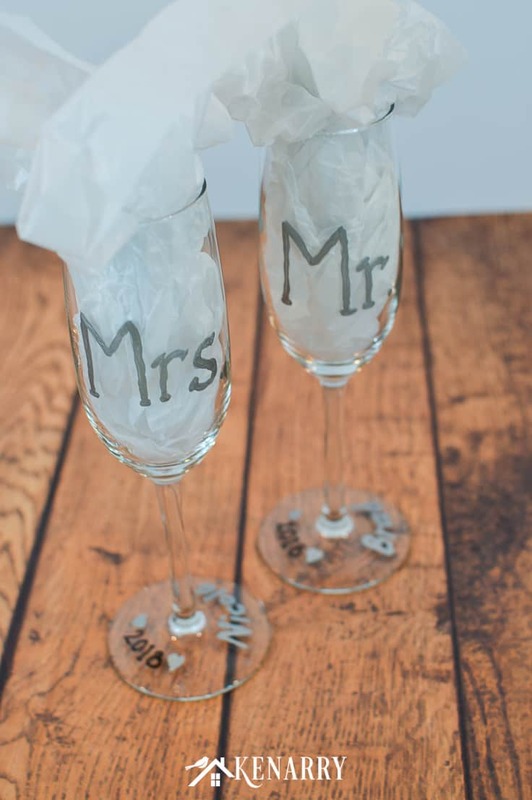 Need an easy gift idea for a bridal shower or wedding? 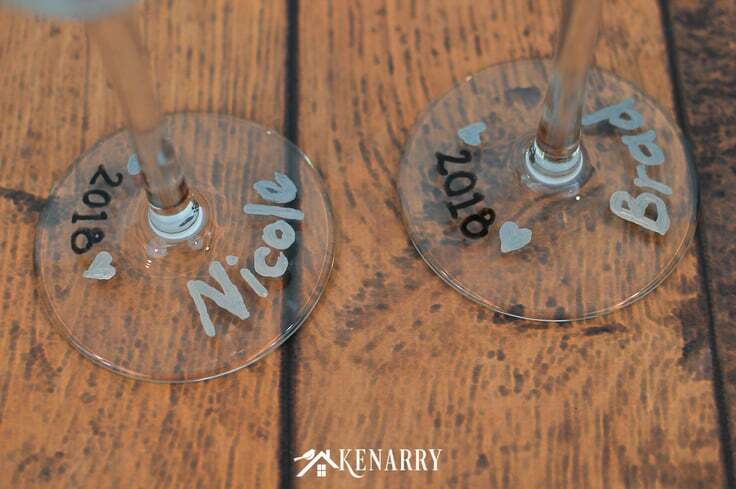 Learn how to make personalized hand painted champagne flutes. 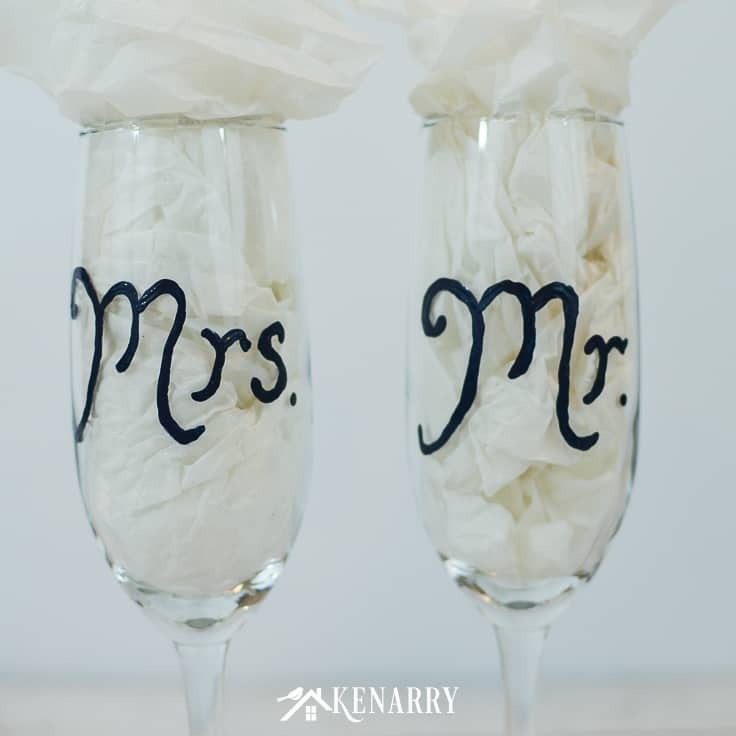 These Mr. and Mrs. toasting glasses are an easy DIY gift for the bride and groom. You can even customize them to celebrate a special event or anniversary. It’s summer time which means it’s wedding season! Time for engagement parties, bridal showers, bachelorette parties and other special events to celebrate the bride and groom. With so many parties, you need an easy budget-friendly gift, but it’s even better when it’s personalized too. I’ve got two cousins who are each planning weddings for this coming fall. My cousin Jessica and her groom are hosting a large wedding filled with all the traditional pomp and circumstance and a big reception. Her brother, Brad and his bride are planning a small private wedding and reception in their backyard for only their closest family and friends. To celebrate their engagements, I wanted to come up with an easy, inexpensive yet personalized gift I could give them. 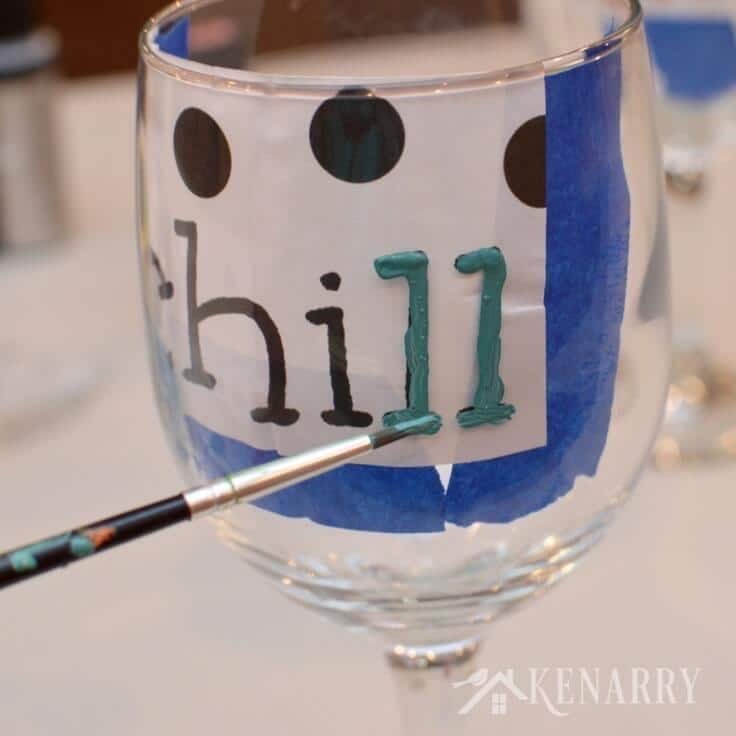 I love making hand painted wine glasses and appetizer plates or DIY coffee mugs with gloss enamel paints. So I thought it would be really fun to make hand painted champagne flutes for each of the couples. 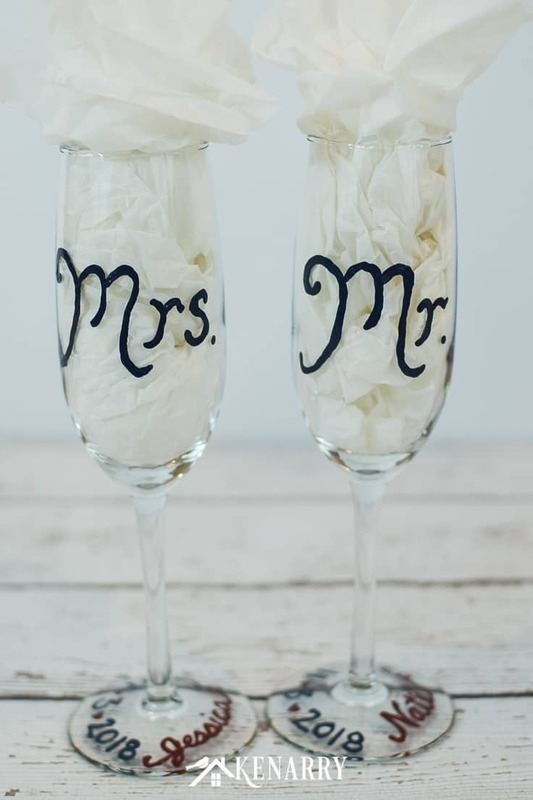 I wanted them to be simple yet pretty enough that my cousins could use them as toasting glasses at their wedding receptions if they choose. Disclosure: This blog post contains affiliate links for products or services we think you’ll like. This means if you make a purchase from one of these links, we’ll make a small commission at no additional cost to you so we can keep the great ideas for the home coming your way. All opinions expressed are our own, derived from our personal experience. 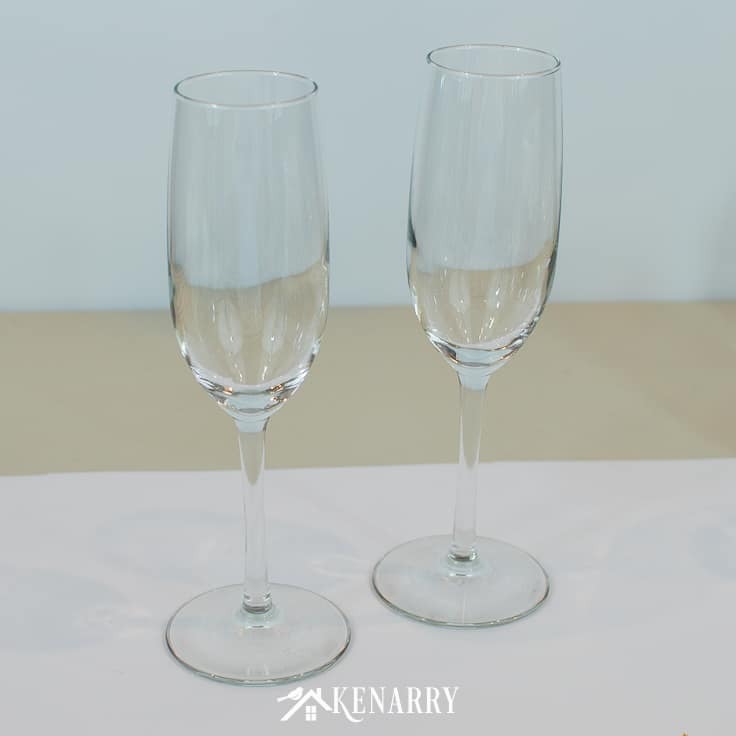 Simple glass champagne flutes are inexpensive and available at any local department store or online. This makes it a great low cost gift to make for a bridal shower or wedding. For this project, I also used Silver Gloss Enamel Metallic Paint. 1. Prepare the champagne glasses. Remove any stickers from the glassware. If there is sticky residue leftover, just use a little Goo Gone on a cotton ball or paper towel to remove it. Wash and dry the champagne flutes thoroughly so you have a clean surface for painting. 2. Decide what kind of design you want to paint on your champagne flutes. For these engagement or bridal shower gifts, I wanted to keep them simple so I chose to just paint Mr. and Mrs. by freehand. Then for the bases I painted the bride and groom’s first names and their wedding date or year. 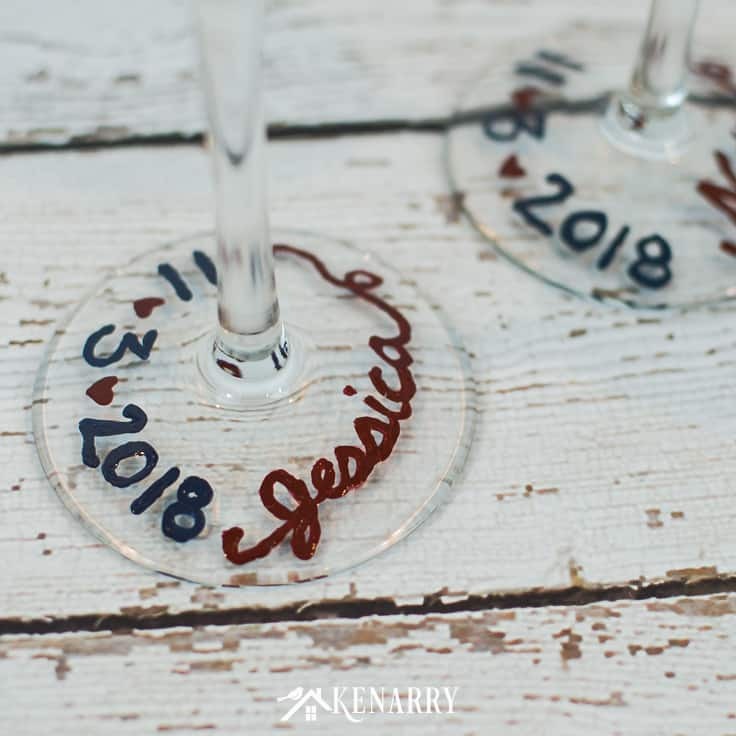 Or you could skip the lettering all together and just create a whimsical design using the bride and groom’s wedding colors similar to these fall hand painted wine glasses I made. 3. Paint the first layer on the champagne glasses. Pour a small amount of gloss enamel paint in your plastic palette. 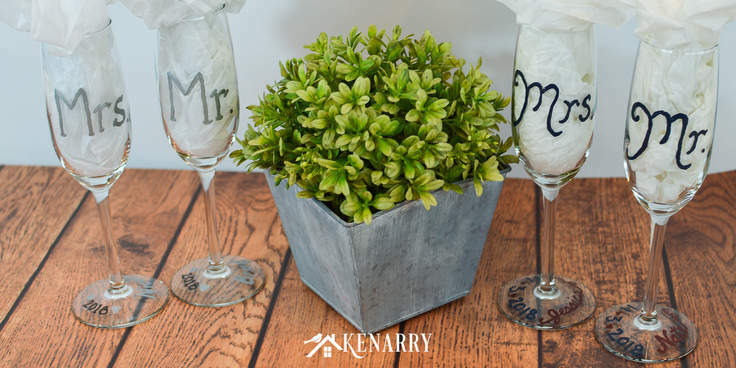 You can add small amounts of other enamel paint colors and mix them together to match the bride and groom’s wedding colors. For example, my cousin Jessica’s wedding is going to be navy blue and burgundy red. I used the “save the date” magnet she sent to match the paints to her colors. 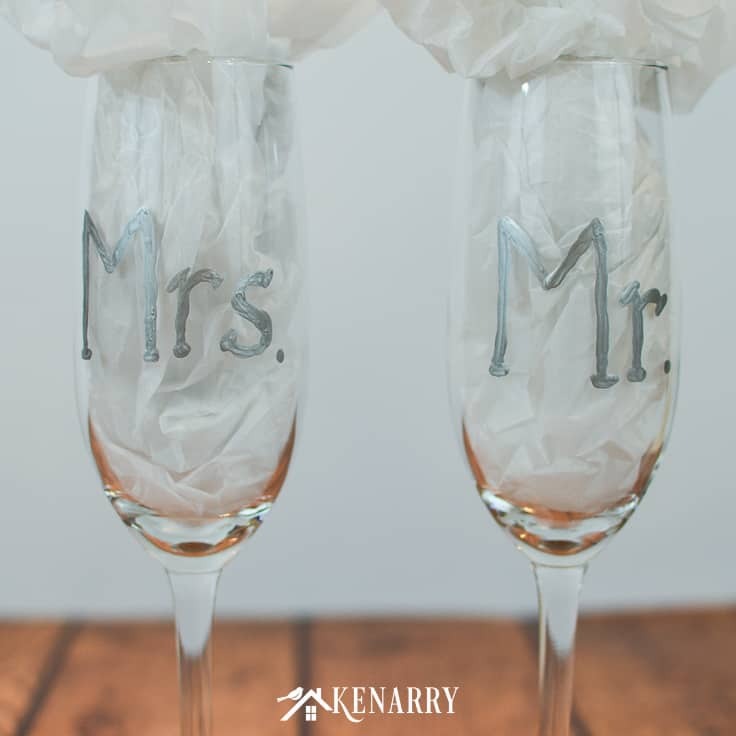 Once my paints matched Jessica’s wedding colors, I carefully painted Mr. and Mrs. in navy blue on her wedding champagne flutes. After that, I put her name and her fiance’s name on the base of the hand painted champagne flutes in burgundy cursive letters. 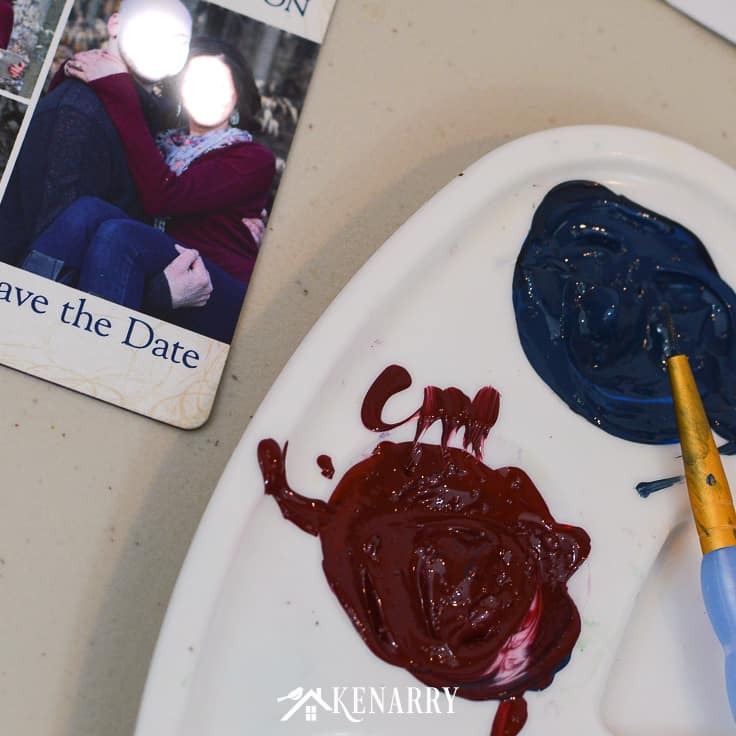 I painted her wedding date in navy blue with burgundy hearts between the month, date and year. 4. Paint additional layers on the champagne flutes. Once the first layer of paint dries on the champagne glasses, you may find you need to paint 1-2 additional layers to get the coverage you want. Make sure you let each layer dry completely before painting the next layer. You can use a blow dryer to speed up the drying process. 5. 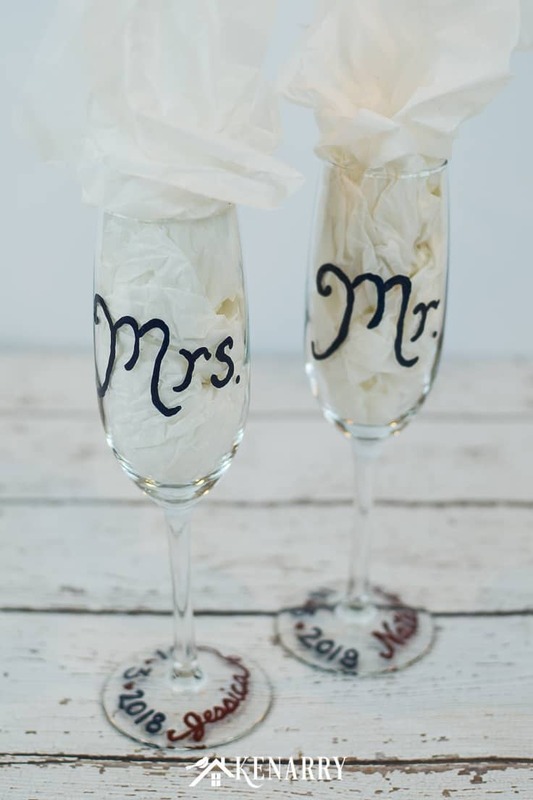 Paint additional champagne flutes for other wedding gifts. Get as creative as you want with your toasting glasses! There’s no right or wrong answer here as long as you only use gloss enamel paints. You can even use metallic enamels like I did for the champagne flutes I painted for my cousin Brad’s wedding. I actually used a black enamel paint pen to put the year on this set. 6. 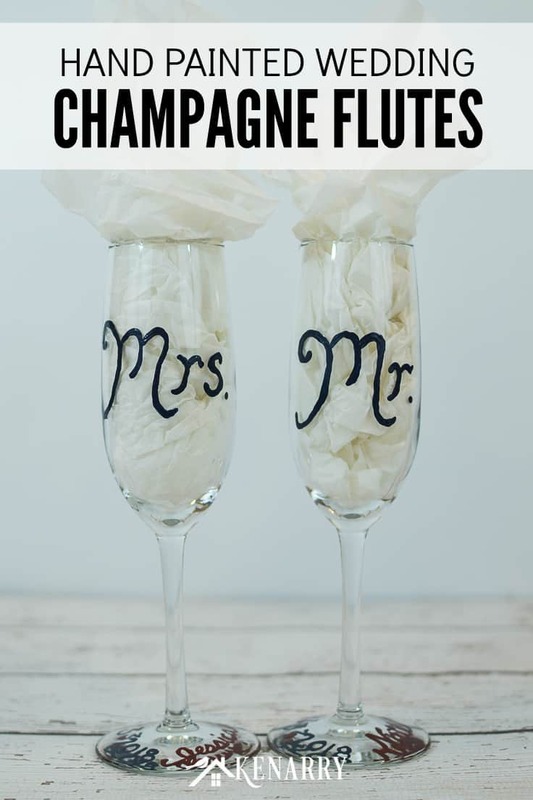 Allow your hand painted champagne flutes to dry. When you’re satisfied with your toasting glasses, let them air dry overnight or even a few days. You want the gloss enamel paint to be completely dry before you move on to the next step. 7. Cure the paint on the DIY toasting glasses. Method 1: Air Dry. Let the champagne flutes air dry for 21 days. Method 2: Bake in the Oven. Put the champagne flutes on a metal baking sheet. Place it on a low rack in the oven. Heat the oven to 350 degrees. Bake the glassware for 30 minutes. Turn the oven off and allow the champagne glasses to cool naturally with the oven before removing them. IMPORTANT: YOU MUST PUT THE HAND PAINTED CHAMPAGNE FLUTES IN THE OVEN BEFORE YOU TURN IT ON TO PREVENT THE GLASSES FROM BREAKING. Once the paint has cured on the DIY toasting glasses, they are top-rack dishwasher safe if the champagne flutes you bought are dishwasher safe. You can now enjoy your new DIY toasting glasses! Use them for your own wedding or turn them into a gift for a friend. 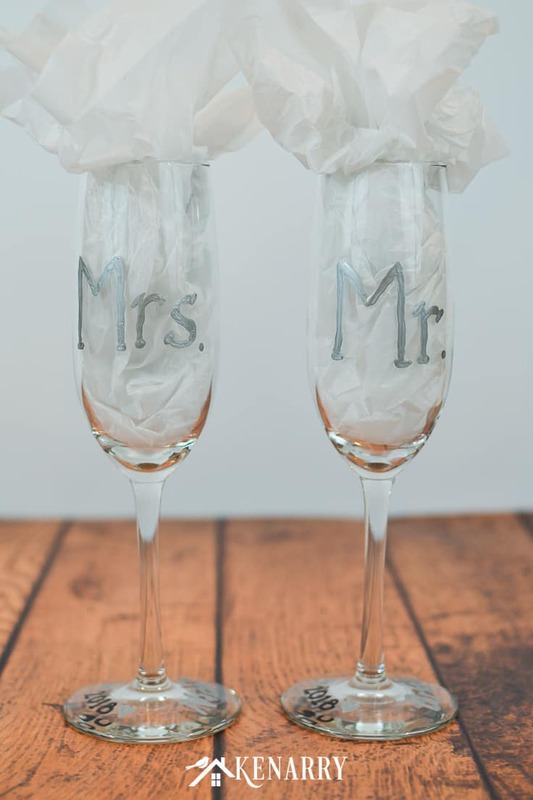 Ideas to make it a DIY wedding gift. 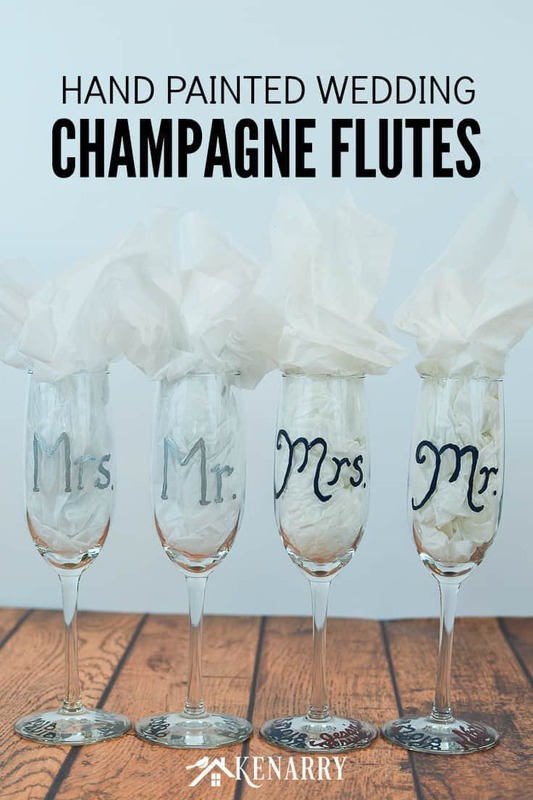 These DIY champagne flutes would be a great bridal shower, wedding or anniversary gift. You could give the toasting glasses as they are or turn them into a fun gift basket. Fill the basket with a bottle of champagne, Prosecco or sparkling juice, crackers and non-refrigerated cheeses, chocolates and other delicious goodies.